The home is situated on Lafayette Bay and down the shoreline from the old Lafayette Landing, the once regular stop on the streetcar boat line in Minnetonka Beach. The front porch of the home was built so that the Thompsons and guests could observe and enjoy all the hustle and bustle of the Lafayette Club, which was originally oriented towards Lafayette Bay. Today the streetcar boat Minnehaha regularly journeys into Lafayette Bay past the Thompson House and the old Lafayette Landing. The summer home is beautiful inside and out, due much in part to the family’s great effort to maintain and preserve it. The home has gone under extensive renovations to stabilize the front porch in 2003 and again in 2006. The renovations were featured on the PBS series Hometime. The interior continues to be loved, cherished and enjoyed. Details such as walls fashioned from old railroad box cars and large, red brick fireplace make for the authentic, innate charm. 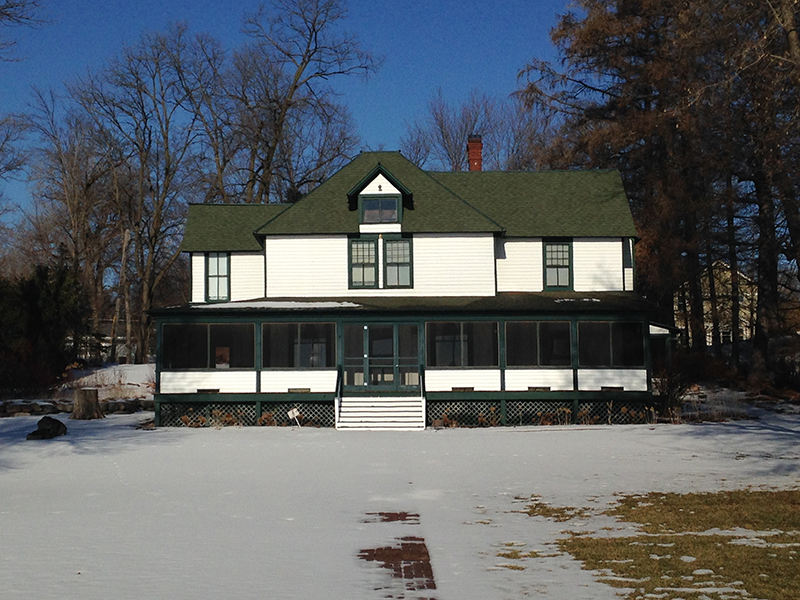 The exterior is white with green trim and roof, and guests are still greeted by the inviting wrap around porch overlooking Lafayette Bay. The Thompson Summer Home was listed on the National Register of Historic Places in 1997. The home is still owned and enjoyed by the Thompson family.